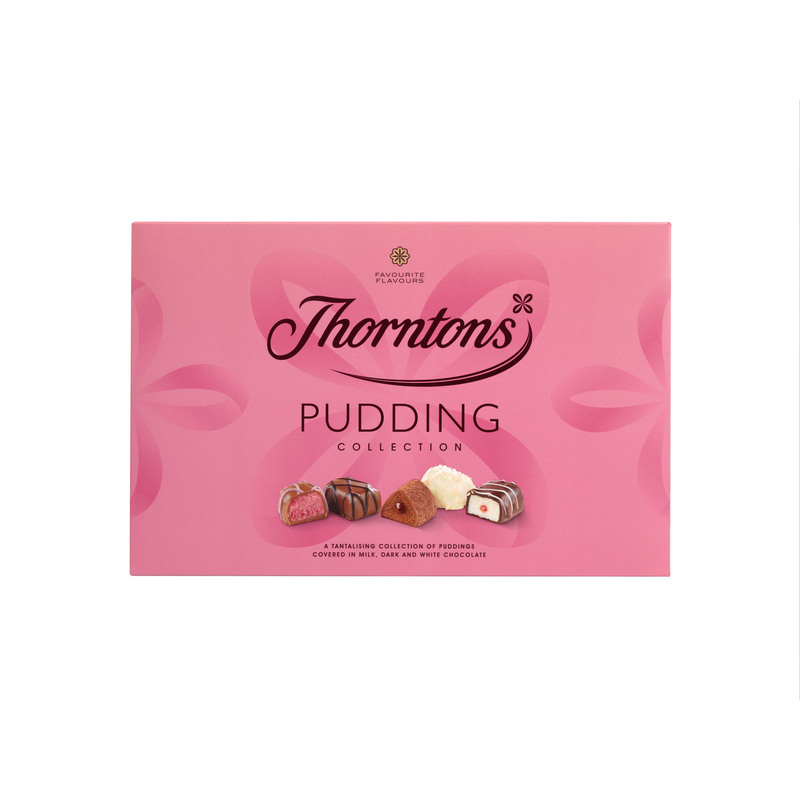 The Thorntons Pudding Collection box contains an exciting assortment of chocolates created around favourite pudding flavours. 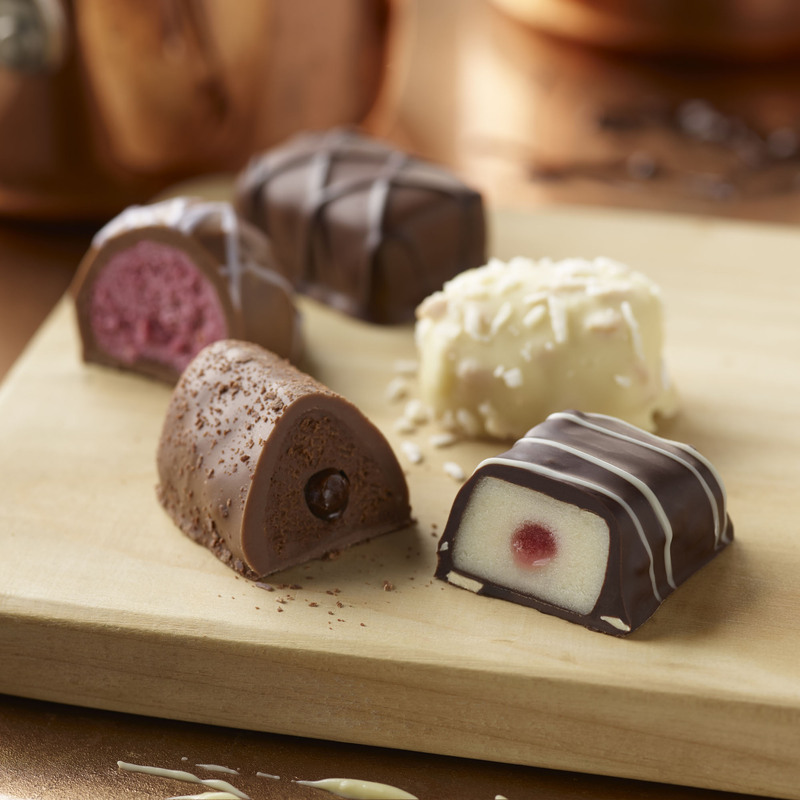 With delicious new creations like the Chocolate Pudding and milk chocolate covered Blueberry Cheesecake joining favourite flavours like the Manchester Tart, this box of bite-sized pudding-themed chocolates is a treat for everyone. You’ll find 22 chocolates displayed temptingly in the single layer box, making the Pudding Collection a great dinner party gift or treat to share - after all, there’s always room for pudding! Sugar, Cocoa Mass, Cocoa Butter, Dried Whole Milk, Glucose Syrup, Double Cream (Milk), Humectants (Sorbitol, Glycerol), Almonds, Butter (Milk), Palm Kernel Oil, Desiccated Coconut, Milk Fat, Dextrose, Glucose-Fructose Syrup, Ginger, Single Cream (Milk), Emulsifier (Soya Lecithin), Concentrated Blueberry Juice, Fat Reduced Cocoa Powder, Dried Whey (Milk), Mascarpone Cheese (Milk), Sour Cherry Juice, Dried Skimmed Milk, Raspberry Purée, Freeze-Dried Raspberry Powder, Whole Milk, Hazelnuts, Sweetened Condensed Milk (Whole Milk, Sugar), Flavourings, Invert Sugar Syrup, Concentrated Raspberry Juice, Lemon Juice, Salt, Acid (Citric Acid), Stabiliser (Invertase), Colours (Anthocyanins, Beetroot Red), Concentrated Lemon Juice, Acidity Regulators (Sodium Acetate, Acetic Acid), Gelling Agent (Pectin), Plant and Fruit Concentrates (Spirulina, Apple).